Tonight’s 800 free relay has some big significance to relay lineups on the other four relay events this weekend. A swimmer sitting out the 800 tonight is able to contest all four of the other relays if needed, while a swimmer who competed tonight will either have to skip one relay or swim only two individual events. Texas using Cook was a longshot – they had four pretty solid legs, and Cook didn’t swim much 200 free this year. 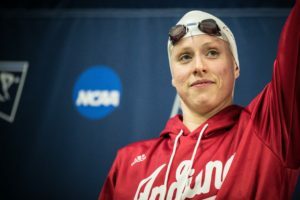 She was solid coming out of high school, but now is freed up to swim the 200 and 400 free relays, and perhaps anchor a medley or even swim backstroke if needed. Cook could even just swim prelims and spell Claire Adams or Grace Ariola, who figure to compete a lot this week. NC State scratched their 800 free relay. They were only seeded 18th, and would’ve needed a drop of about two and a half seconds to score tonight. 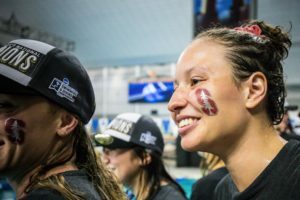 Of the members of that relay at ACCs, Kylee Alons stands out – she could now swim all four relays, whether in prelims or finals. Alons split 51.5 on the 400 medley at ACCs, but didn’t swim the 200 medley – that fly spot went to Sirena Rowe in 23.22. 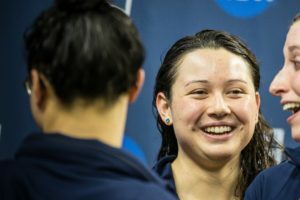 But with Alons’ opening split of her 100 fly (23.6 opening prelims of her 100 fly from a flat start) and her blazing 50 free speed (21.8 individually with a 21.1 relay split) has to suggest she can be faster than Rowe in a 50 fly. Alons is now freed up to swim the other four relays, and that has to be the motive behind NC State’s scratch out of this relay. Hansson is the biggest impact swimmer when it comes to the other four relays. Last year, the star free/flyer swam all five relays, scratching the 200 IM. But this year, her IM projects to score big points, likely in the A final. That would mean she’s got to skip one of the relays. Hansson is awfully valuable as a flyer on both medleys, so the choice probably comes down to the 200 free relay or 400 free relay. USC’s lowest-scoring relay was the 400 last year, taking 14th, but they left Hansson off of the 200 free relay at Pac-12s. Fortiutiously, that was the relay the Trojans DQ’d. Their mid-season time only ranks 18th nationally, so that might be the best option for leaving Hansson off. Using Brown and missing scoring entirely is a disaster for Tennessee. The Vols didn’t swim all that well, and now have to leave Brown off one of their other relays. They’re title contenders in the 200 medley, and their 200 free relay also ranks highly. So it might be the 400 free relay that Brown skips – it’s currently ranked 11th nationally and a fully-returning team got 6th last year, but without Brown, there’s a chance they don’t even score. The 400 medley is another possibility: they could conceivably score without her there, but would need all four legs to be on. Ruck and Eastin were highly-likely to swim this relay – they’re only on this list because they could be of value on any of the five relays. The more distance-oriented Eastin isn’t a huge factor on the 200 free relay, so that’s likely the one she’ll skip. Ruck might be the team’s best 50 freestyler, which makes her pretty indispensable to the 200 free relay. 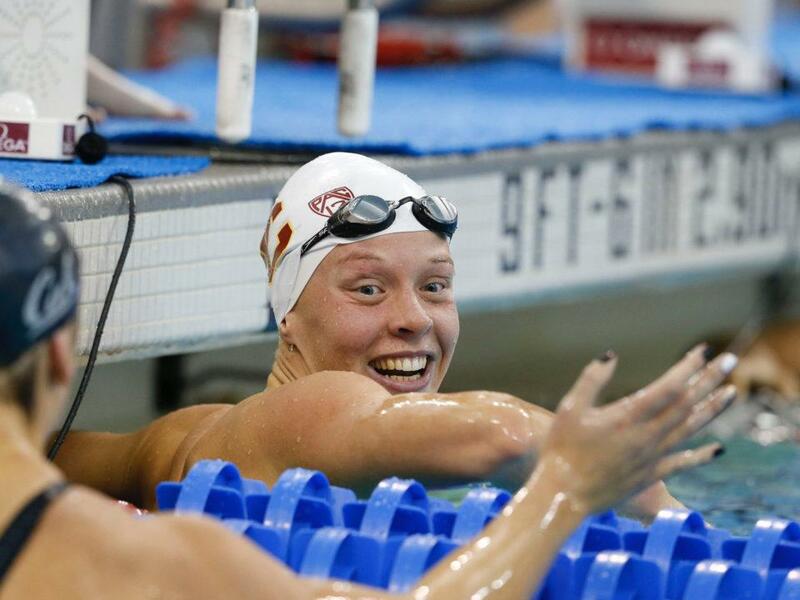 She skipped the 400 medley at Pac-12s, but that relay is rough without her, ranking just 11th nationally. It’s pretty likely she’ll skip one of the medleys. Comerford was always going to swim this relay. Louisville left her off the 200 medley last year and still got 5th. With all four legs returning, it’s highly-likely that’s the non-Comerford relay this year as well. Adams swam five relays for Texas last year. She’s only entered in two individual events this year, so it looks like the same lineup again for the Longhorn. Nelson can swim anything, too. She’s vital to the medleys as arguably the best backstroker in the nation and one of the top flyers, too. She didn’t swim the 400 free relay last year, though Wisconsin does rank 10th nationally right now with her. They’re only 22nd in the 200 free relay, so that might be the Nelson-less Badger relay. Hill is Virginia’s best sprinter in both fly and free. At ACCs, she skipped the 200 medley relay and the Cavaliers did fine without her, so that’s probably what they’ll plan to do again. The other minor projections we can do tonight are which teams appear primed to swim their best this week, and which ones missed the mark on night 1. Tennessee certainly falls into the latter: they gained six seconds from seed and went from 6th to 18th. None of the four swam particularly well, but a 1:48.1 from Stanzi Moseley can’t bode well. Moseley was a full five seconds faster last year, but looked off at SECs. She’s also a key part of the 400 free relay, and her struggles tonight probably reinforce the decision to keep Brown off that relay. Projections of Tennessee finishing fourth as a team are looking a lot shakier. As noted above, Cal and Stanford both swam about where we projected them. USC outperformed what we expected from them – straight 1:43s to go with Hansson’s 1:41 are a good sign for the Trojans this week. In addition, Wisconsin really swam well. They were the biggest point gainers tonight, and three of their four legs went significantly faster than at Big Tens. Nelson dropping from 1:42.0 to 1:41.3 has got to bode well for her in the 200 IM, not to mention her backstroke races. 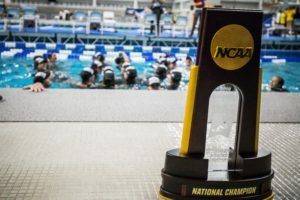 SwimSwam – Would it be possible for you to record tomorrow’s top circle seeded heats and post them (just as you did with the 800 relay tonight)? We’ll do our best! We’ve been given permission to record everything that’s not going on ESPN – so prelims and the 800 free relay finals. So long as that remains the case we’re going to try and film everything that we can. The rest of the 800 free relay heats will go up as soon as the crew gets to fast wifi. Thank you SwimSwam for superlative coverage. With the Texas video snafu and iffy ESPN view for some non-subscribers – We NEED you!